Peru’s ailing former leader, Mr. Alberto Fujimori, is begging the people for forgiveness, two days after receiving a presidential pardon that sparked street protests. “I am aware that the results of my government were well received on one side, but I admit that I have let down other compatriots, and I ask them to forgive me with all my heart,” Fujimori said in a Facebook video filmed from his hospital bed. The 79-year-old had been serving a 25-year sentence for corruption and human rights abuses committed during his time in office from 1990 to 2000. He was transferred from prison to a hospital on Saturday after suffering from low blood pressure and an irregular heartbeat, the latest in a string of hospitalizations. 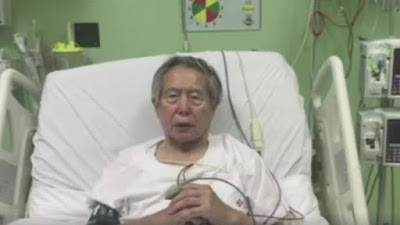 In the video, Fujimori lay propped up on a hospital bed wearing a white gown, with a blood pressure cuff on his right arm and another monitor clasped to his left index finger. He talked over the constant background beeping of a monitoring device. Gray-haired and with bags under his eyes, he spoke clearly, looking directly into the camera but also glancing down as if checking a prepared text that was out of the camera’s view. President Pedro Pablo Kuczynski ordered the pardon of Fujimori and seven other prisoners Sunday on humanitarian grounds, placing himself in the middle of a political crisis just days after he avoided impeachment.